The Special Task Force for Upstream Oil and Gas Business Activities (SKK Migas) has identified 10 working areas with potential oil and gas reserves. Indonesia has now implemented zero tariffs on dates and olive oil from Palestine, as a continuous commitment to support the social and economic development of the Palestinian people. Indonesia and Australia are set to ink a long-awaited trade deal on Monday (Mar 4), after months of diplomatic tension over Canberra’s contentious plan to move its embassy to Jerusalem. Indonesia’s national disaster agency spokesman Sutopo Purwo Nugroho has lamented the theft of a forest and land fire early warning system in South Sumatra, a province that is prone to wildfires. Indonesia’s largest Islamic organisation, Nahdlatul Ulama, has issued a call to end the usage of the term “kafir”, or infidel, to refer to non-Muslims in state or citizenship matters, a move that may be aimed at calming religious tensions ahead of the presidential election. Intellasia East Asia News An illegal gold mine in Indonesia has collapsed and buried dozens of people who are “screaming for help,” according to a disaster management official at the mine, where three people were confirmed dead. Indonesia has been struggling to handle rabies in its different parts over the past years despite the related authorities` serious endeavor to deal with this serious global threat. The Environmental Affairs and Forestry Ministry has used the international musical event of Java Jazz Festival (JJF) to campaign on waste management. 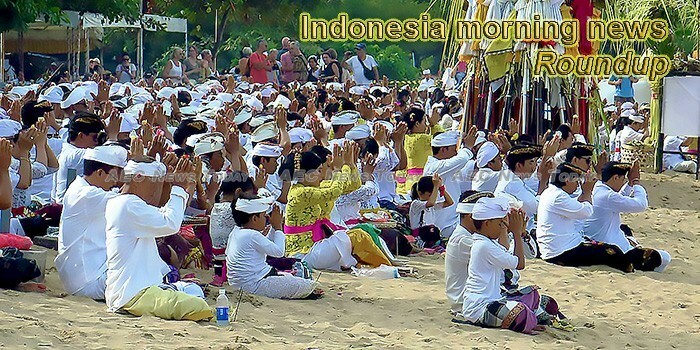 The fourth Indonesia Festival in Russia will be held on Aug. 1 to 4 by the Indonesian Embassy in Moscow (KBRI) supported by the Foreign Ministry and Tourism Ministry. An official overseeing a gruelling rescue at a collapsed Indonesian gold mine said that the voices of dozens of trapped miners are no longer being heard as the effort to reach them continued for a fourth day yesterday. Coordinating Minister of Economic Affairs Darmin Nasution voiced doubts on the “facts” mentioned by opposition presidential candidate Prabowo Subianto in regard to the wealth of Indonesians kept overseas. Terraced rice fields plunging to verdant valleys; giant Buddhas sitting in stone bells overlooking smoking volcanoes; temple ponds blooming with lotuses; and more tropical beaches than any other country in the world. Indonesia is as tantalising as Thailand, but it’s never been as easy to explore. A joint team of the Indonesian military, police and regional disaster mitigation agency (BPBD) has put out some 80 percent of peatland fires in Nagan Raya District, Aceh Province. Presidential hopeful Prabowo Subianto considered an issue on the deficit of the Health and Social Security Agency (BPJS Kesehatan) as a small matter that can easily be solved if elected as the president. As spring approaches in South Korea, the Embassy of Indonesia in Seoul hosted an appreciation and networking night for around 40 prominent figures in the South Korean travel industry, such as the chairman, director and members of the Korea Association of Travel Agents (KATA). Vice presidential candidate Ma`ruf Amin has called on people to build the nation great in ways which are honest and without slander and hoaxes. Switzerland may let up to 5,000 people smoke marijuana legally in pilot studies to help shape new rules for recreational use of the drug, the government said on Thursday, Feb. 28. The Special Task Force for Upstream Oil and Gas Business Activities of Indonesia (SKK Migas) has identified 10 working areas with potential oil and gas reserves. Indonesia joined Vietnam recently to challenge Duterte’s doctrine in the South China Sea. Presidential candidate Prabowo Subianto highlighted issues on the threat of population explosion and climate change in Indonesia during a dialogue with seven communities in the health sector. The waste challenge: Is Indonesia at a tipping point? Every 20 minutes, the equivalent of a 10-ton truckload of plastic is dumped into the waters around Indonesia. Globally, if this problem goes unchecked, there will be more plastic in the oceans than fish by 2050. Inflation in Indonesia eased to a near-decade low, boosting odds that the next interest rate move by policymakers in Southeast Asia’s biggest economy could be down. There are 135,000 snake bite cases in Indonesia every year, and they can be a time bomb as victims often opt for treatment by shamans, an expert has said. Bank Indonesia (BI) will undergo an accommodative macroprudential policy and strengthen the payment system policy to expand economic financing. National flag carrier Garuda Indonesia is set to open up several new international routes this year. Indonesian Vice President Jusuf Kalla officially concluded the Nahdlatul Ulama`s (NU`s) National Meeting of Ulemas and Conference here on Friday by appreciating a recommendation highlighting the importance of reducing plastic waste for environmental conservation and preservation. Thirty three-year old Muslim woman Fransisca Santa Clause suddenly became known after her posters as a legislative candidate for the Sleman Legislative Council (DPRD) went viral on social media. The government has slammed tech giants for failing to filter content that it says has contributed to the spread of misinformation on social media. Indonesia on Friday kept cocoa export tax at 5 percent for March, where it has been since last July, according to a document uploaded on the trade ministry’s website. Intellasia East Asia News The head of Indonesian President Joko Widodo’s re-election campaign said on Wednesday supporters should not be complacent over the incumbent’s lead in opinion polls, given the high number of undecided voters and threat of fake news. The results of a survey carried out by Cyrus Network revealed the campaign teams of both Jokowi-Ma’ruf Amin and Prabowo Subianto-Sandiaga Uno were still underperforming in the field. SYNERGY Strategic Solutions Limited, a global management consulting company with the prime focus on the Insurance industry, won the prestigious Technology Excellence Award for Robotics – Financial Services. Intellasia East Asia News An Australian man has been sentenced by a Bali court to five years and four months in jail, more than six months after being arrested while in possession of nearly 12 grams of cocaine.